As strange as this might sound to you dear reader the following came to me a few moments ago. A must share for definitely I am guided by unseen forces. Spiritual ones that is. “You will flourish.” It came in silently in my mind. I never question these insights for they come out of the blue. If you have been following my journey of this year you will know that I have moved to a much improved situation. I wake to birds in the many trees surrounding my condo with there song. Add to this is a quietness which is a tonic. My mind has settled and thus my body follows. Peace & tranquility. I am the Queen of Serene! So I thank my guides for giving me this beautiful message and wonder what tomorrow will bring. I think back on my life and on the many experiences that the universe has allowed me to have. Some good, some bad, some terrifying. This was to come up in a phone conversation from one of my close friends yesterday and how PTSD had taken the memories from all and maybe not all but certainly the worse of the worse ones. As we were talking it arose the image of me held captive for two or three days before I was to escape this dark room in a small house. I had been taken and handcuffed to a pipe, left to wonder about what was to happen. A man came into the room and crying to him, I begged him to let me go, that I wouldn’t tell. He turned away but not before he unlocked the cuffs from my wrist. I was to wait until he left and then sneak out the back door which he was going to open for me. Dashing out in the brilliant sunny day I felt alive. That is all the memory of that day has let me replay and for that I am grateful. That happened so long ago. Life make us who we are. It’s as simple as that. We can either carry that burden on our backs and name it victim but I would rather not call it anything at all or carry it for that matter. Deal with it in the present moment and move on. Make the mistake as I did and ignore the situation and it rears its ugly head in some other form or other. Knowing that is to live in the now and to savor it, understand it for what it is. All to often we as people use food, alcohol, gambling, etc, as diversions to take that pain we have stuffed down on selves. Our souls crave to escape this mad cycle. Was it the day that life said no more for this one? Having that meltdown in my work many years ago certainly did the big turn around for me and brought me to this path of awakening. To understand my purpose. And the ride my friends has been spectacular from this huge merry go around of soul searching. They say that the teacher come to those that wait and it is true for me. I have had many opportunities and those that I gladly accept. Many workshops, readings to understand where I am, classes and healing sessions. Am I the same person of 16, 23, 38 or 49? No, not even close. True I have my wicked sense of humor and still love to tell stories designed to make you think but my decision making skills have definitely vibed up. This lady has got her chance her kick at the cat so to speak. I can hardly wait to see what happens today. I was bitten by the travel bug as a young child getting dressed up to sit on a Greyhound and endure a 3 or 4 hour ride to the big city. If it was a milk run then it was all night. I can still smell the diesel of the old bus and the late night stops in some sleepy town with a quick run, my mother and I to the washroom and the store to get some promised pop and chips. The crying child, not me for I was a good little girl, and hearing a slap and a threat to be good. Yes that memory still stands in my mind. I looked at the mother of this now quiet child as they got off the bus and thought how scary she was to me. It was to be with these trips to the city that we would be meeting up with my father who was coming back from some place on this earth serving the army. If we were lucky we would get into his vehicle and travel to the mountains and stop on the way perhaps a campground and dad would pull out the old Coleman cook stove and start grilling hot dogs. Yum, I still smell that too! And if we were not travelling for pleasure then it was travelling to move to another home or to travel for his work. Having been the lucky one to remember all the sights and scenery with all the places in Canada that I have seen. In my early twenties I was to hitch hike across our beautiful provinces with a friend and it is something that I would not highly recommend now. I was quite lucky to be intuitive and to know what was good and what was not. To know where to go to get a ride with the truckers and how to speak respectfully so I could get that back. Creator must have been looking down on me for it was on this trip four provinces away that we were stuck in between Sault Ste. Marie and Sudbury at 4 am no less. The friend and I were arguing as to what I cannot remember and she started to walk up the road a little miffed with my carefree attitude and no sooner when she was just shouting distance than a limousine pulled up. The window in the back went down and lo and behold it was a priest. “Would you like a ride my child” he inquired. We pulled up to my friend and now she was fuming but of course got in with out a word. I woke to the smell of the sulpher in Sudbury on a hot morning with my head resting on the priest and had dribbled on his coat in my sleep. He had told me that this was as far as we could go and so we walked into the city. My life was to take on bigger dimensions by me meeting my future but now ex-husband who would then travel by motorcycle to cities a few days away. Those days were so carefree as I seen so much from the back of that bike and smelled the clean air and took so many photos. More often than not we were to travel with other riders so it made for a idyllic time. This married time with him was getting on planes to see my all time favorite city, New York and to follow the eastern coast. On the spur of the moment we loaded the trailer and tripped down the west coast all the way to Los Angeles. So many people I have met, so many conversations, so many experiences, so many places that I have dined. My life now reflects what I do with having my quiet time, to meditate through my photography , to travel down dirt roads to find that perfect picture. I may get lost but find my way always when I just park and sit for a few and then proceed. I always find great gems too so its never a bad diversion but a lucky happenstance. Having met a man who is now a big part of the picture has taken us to many places in my beautiful province of Alberta and also B.C. but also abroad and to the south eastern coast. Simply put he is my other half who shares the same wunderlust as me. Being a middle aged woman I often wonder where my life will lead but I do know it will always involve travel and adventure because you have to have a great story to go along with it. Next time when I wake in the morning I will take a bottle out and spin it and see what direction it will take me. Me thinks that is good advice to moi. This morning I had the urge, huge urge to get in my car, travel to a pilgrimage an hour away from my city, a nice drive out in the country to the lake. And when I parked the car I heard my name called a few times, “Gail! Gail! !” trying to get my attention. My mother, bless her heart was in a vehicle with two of my aunts parked a few cars down. I knew that this was providence and going to be a fun day even though the services would be solemn but joyous. Love the singing part myself! Lac Ste. Anne is a site for the annual pilgrimage, a spiritual gathering with many hundreds in attendance. Here follows what Parks Canada explains in more detail than I could. An outdoor church, a huge building that seated hundreds under that wooden roof with many benches was the first time for me to experience this since I was a child. The service took no time at all and after I walked towards the lake as it is known for its healing waters. In ankle deep water and watching others going way deeper, I said my prayer, the whole reason I came. People come from near and far for this event and my mom introduced me to long lost relatives from my father’s side of the family. My Aunt Violet, seeing me for the first time since I was a baby couldn’t get over the family resemblance and frankly neither could I. Her son Dennis and his son, Raymond and I made an instant connection, just like we knew each other for the longest time. No sooner had I met them there were more cousins that came over to say hello. That was pretty darn cool to meet this friendly bunch, getting to know each other and then hugging each other goodbye. I sure hope to see them again! 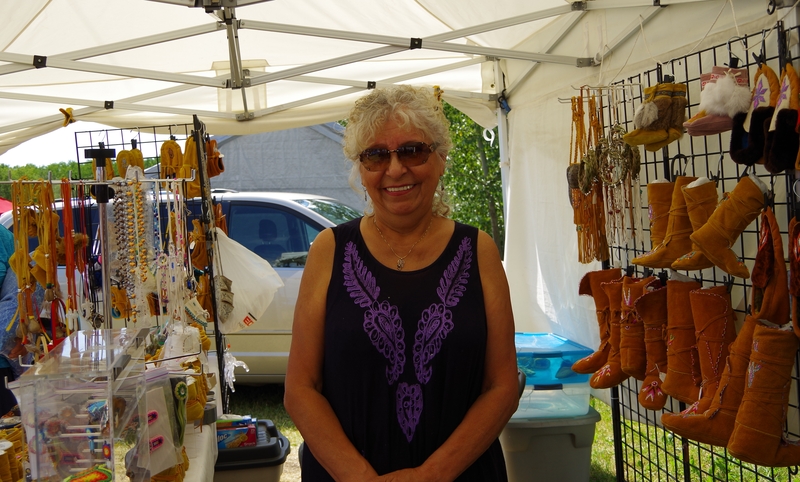 There were many vendors and I was walking along and spied my Aunt Bertha who I met a couple of years ago. My dad and her were inseparable and when he would come into the city he would stay with her. She was telling me stories today about him, how impeccable he was. Always cleaning and keeping everything neat and tidy including her children. I started to tear up as I really never knew what made this man tick. But it also made me laugh because I picked up on his ways. For me everything has to be perfect. So there you have it. That huge urge to make this trip and not only to see what this pilgrimage was about with my adult eyes but also to walk into wonder and connection for my emotional being. Dad, I know you are watching me from where ever you are and I thank you for making my day! I have noticed of late how busy you are and that you delight in this adventure of your life. Learning too from like minded people that have seemingly been drawn to you. See how it works when you envision your desires and dreams? And when you redirect your thoughts from judging to just letting it go. Your journey, your business. There journey, there business. And that bit about being a peacemaker, well my girl you got to let that go. You cannot make everyone happy. I note that you also getting it and that it was always in you from the start. You call it Realization or what you love to call, your Aha moments. Keep at it all the meditations as it will keep you grounded, calm and all that great stuff that goes with it. And above all, Listen! Loyal, trustworthy, loving, caring, fun, witty, adventurous, all attributes of a wonderful friend.From the time we are small children we meet with like minded people that we love to hang around with. As a child I had a crew of best buddies who nutured our friendship with sleepovers and penny arcades, trips to the local swimming pool, baseball, football games we played until it was too dark to see. Camping out with them and walking through the woods with not a plan in mind but looking forward to the day and see what we could get ourselves into. The years go by and we enter high school and now we meet other new people. But isn’t that what life is about. The ebb and flow of the tide. Yes there have been some that have stayed and are still around and then some gone. They moved on, I moved on. I can say though through thick and thin there have been some that have been there for me and I for them. Even with all there stuff, they are there through the good and the bad. We could not see each other for years and pick up where we left off because that is what we do. And then there are some that are the constant in our daily lives. I am grateful, yes I am for the people that I have formed friendships with and the lessons I have been taught and will continue to learn. Because as the song goes, that is what friends are for. And so I seem as though I am living another life. I have always been the girl who went to church, dutifully. I never seemed the get why I was in church. I would gaze at all the statues, the stained glass, the ceremony and yet I was waiting for someone to blast through those doors and say, “Here I am!” As my younger adult years went on I sadly gave up going as in my mind that I had been made to. This was my belief. In 2009 I went through a life changing treatment with the usual effects of hair and weight loss but came through that with all the bells and whistles months later. My spiritual awakening came in the middle of that treatment. It had already been months into it and one day I dragged myself to the kitchen so thirsty, so hungry but yet very weak. I fell to the kitchen floor and started to cry. It was all I could do but in the middle of my feeling sorry for my self I decided to ask Him for help. So I prayed for Strength and then I thought a little more and since I was still down there on the floor I asked for Joy. I felt this surge go through the tips of my toes to my head and as I picked myself up by the stove I started to laugh. Everyday I wake up either laughing at something that I have done or I remember something funny. Not a day goes by that I say how grateful I am. We have a church in the downtown area where I started to attend services. I have to tell you my experience is totally different and now I understand it. I also know that He is always with me and walks with me and so I am not beholden to this building although I do attend when the feeling hits me. It’s like visiting with good people and that my friends is pretty cool! Now that my intuition has opened up more I know that having spirituality is a big plus. They go hand in hand. The gift is all in us but I figure it all up to us to use it. That is my belief. This past year has been a sense of wonder and of knowing and also having mentor help me to develop this. I meditate on a daily basis whether it be guided or just walking outside or even in the moment of taking my pictures. The meditation has definitely helped to calm me but also to take away those awful migraines I had. I find that I can be present. I get that when I worry about something that happened yesterday or could happen in the future I lose out. What happened, has happened and no sense in rehashing it. It serves no purpose.